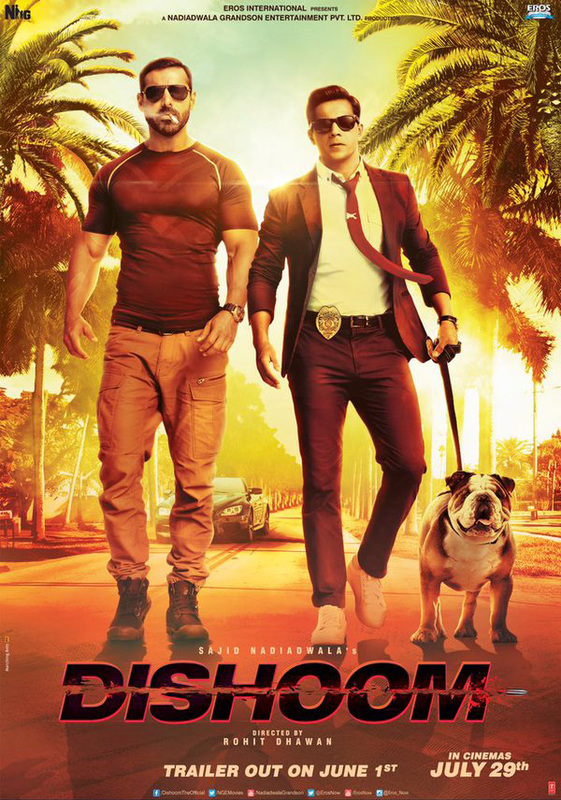 The first poster of actor Varun Dhawan and John Abraham's upcoming action film 'Dishoom' is finally released. The poster is out and both the stars John and Varun will win your heart with their look as fellow cops Kabir and Junaid. It was Varun, who took to twitter and shared the poster he also revealed that the trailer is all set to release on June 1. In the poster, Varun looks stylish as a cop in a blue suit that totally matches his personality, while John's cool casuals fashion statement with just a black tee, cargo pants and boots will surely make your heart skip a beat. Not to miss the cute bull dog in the poster! I'm sure your Monday blues have gone after looking at this pic, both look amazing and awesome together. This movie ‘Dishoom’ is directed by Varun's brother Rohit Dhawan and produced by Sajid Nadiadwala. It is an action-adventure film, which also features Jacqueline Fernandez and Akshaye Khanna in the lead. Dishoom will hit screens on July 29.